For emergency same day delivery service within Lagos, you can book anytime on or before 3:00 PM and we'll surely get your parcel to its destination that very day. Booking for Inter-state delivery will need to be made on or before 7:00 AM for delivery to be possible within the same day. 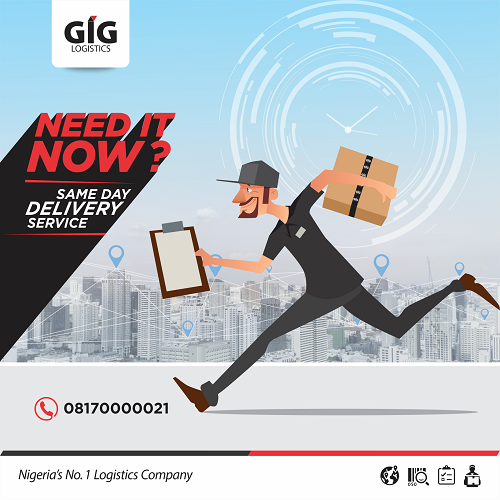 GIGL Same day delivery service is available our terminals nationwide. For further enquiry kindly call or send us an email. Next available van or truck delivery door-to-door to any regional destination within the shortest possible time. Fast response to meet critical deadlines. Parcels dropped during the weekend will be delivered on Tuesday, which is the next working day of the new week. Real-time parcel tracking service at your disposal to keep track of your shipment from pick-off to delivery. Call us on 08170000021 to schedule a pickup or delivery.